The political and economic establishment in the United States has finally woken up to the threats posed by climate change. 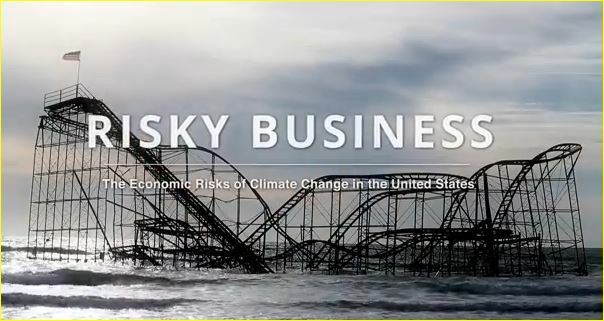 In a new report, appropriately entitled Risky Business, members of the business and policy-making establishment sound the alarm call about the potentially cataclysmic impact of climate change on the US economy. Published by an economic modeling firm that normally works for the fossil fuel industry, Risky Business predicts starkly apocalyptic scenarios over the coming two centuries: more than a million homes and businesses along the nation’s coasts could flood repeatedly before ultimately being destroyed; agriculture will become impossible in Midwest, the nation’s grain belt; heat and humidity will become so intense that spending time outside will become impossible in much of the eastern half of the United States. What does the group propose should be done about this dire situation? According to the summary article in the New York Times, many of the power brokers involved in the report are in favor of imposing a tax on carbon emissions. A step in the right direction, but adequate to the horrifying scenarios depicted in the report? Not half likely! What we clearly need is a wholesale reorganization of the economy away from the cardinal principle of headlong, heedless growth. Not much about that in Risky Business.